Nikon proudly presents an update to its versatile full-frame 70-300mm tele zoom with improvements to image quality, autofocus, speed, VR image stabilization and more. The lens strikes an outstanding balance between size, zoom power and Vibration Reduction, making it a great choice for handheld photos and videos of sports, action, concerts, weddings, wildlife and more. Whether you shoot an FX or DX camera, the AF-P NIKKOR 70-300mm f/4.5-5.6E ED VR frees you to shoot on-the-go from nearly any distance. The AF-P NIKKOR 70-300mm f/4.5-5.6E ED VR is an advanced lens that draws peak performance from Nikon's latest generation of FX and DX cameras. Its versatile 70?300mm focal length range (105-450mm on DX cameras) is great for everything from portraits to close-ups of nature and wildlife. The AF-P NIKKOR 70-300mm f/4.5-5.6E ED VR incorporates Nikon's stepping motor (AF-P) for faster, quieter focusing that's ideal for fast action and video recording. With an f/5.6 maximum aperture at 300mm and a nine-blade rounded diaphragm, the AF-P NIKKOR 70-300mm f/4.5-5.6E ED VR produces a soft, round bokeh blur that beautifully complements its telephoto perspective. Nikon continues to innovate in Vibration Reduction technology, opening new possibilities for handheld shooting and enhancing low-light capabilities, especially useful for a day shooting at the zoo, school sports or family events. 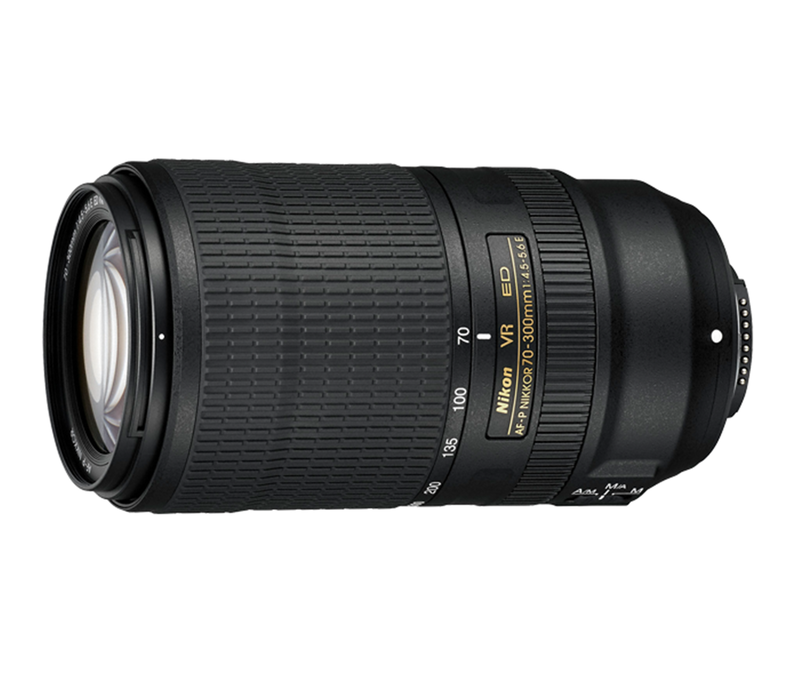 At just 680 grams, the AF-P NIKKOR 70-300mm f/4.5-5.6E ED VR is comfortable and balanced, even on Nikon's most compact DSLR cameras. Its Internal Focusing (IF) design keeps the lens shorter, and its smooth focus ring lets you seamlessly take control when needed. The lens is sealed to protect against dust and water droplets letting you follow your passion wherever it leads. The AF-P NIKKOR 70-300mm f/4.5-5.6E ED VR's large, comfortable zoom ring provides optimal torque for smooth, even zooming across the entire range. Get as close as 3.9 feet from your subject with a maximum reproduction ratio of 0.25x for dazzling close-ups at 300mm. A specialized electromagnetic diaphragm mechanism (E) operates in precise sync with the camera's shutter for reliable exposure control during high-speed sequences. This lens takes advantage of the fast burst speed of Nikon DSLR cameras, as the Electronic Diaphragm not only provides smooth exposure transitions during video capture, but also helps maintain consistent exposure during high-speed shooting, such as when photographing sports. 80.5 x 146mm / 3.2 x 5.7 in.